Looking for a getaway into the mountains? Look no further! You are sure to find things to do with this great condo that is centrally located in Granby, Colorado. BEDS: King in Master Bedroom, two Twin Beds in Second Bedroom and Queen Sofa Sleeper in Living Room; UNIT FEATURES: WIFI, 42 Inch Flat Screen TV w/BluRay Player in Living Room, 20 Inch TV/DVD Player in Master/Second Bedrooms, Washer/Dryer and Full Kitchen; COMPLEX FEATURES: Two Outdoor Community Hot Tubs and Outdoor Grills. Kicking Horse Lodges are centrally located in Grand County and is an ideal launching point for all the recreational activities in our area, with close access to Ski and Bike Granby Ranch and Golf Granby Ranch. Winter Park Ski Area, Rocky Mountain National Park, Hot Sulphur Springs, Lake Granby and Arapaho National Forest are all within a 30 minute drive. Enjoy ski-in/ski-out access when snow conditions permit and the Kicking Horse Lift is running. 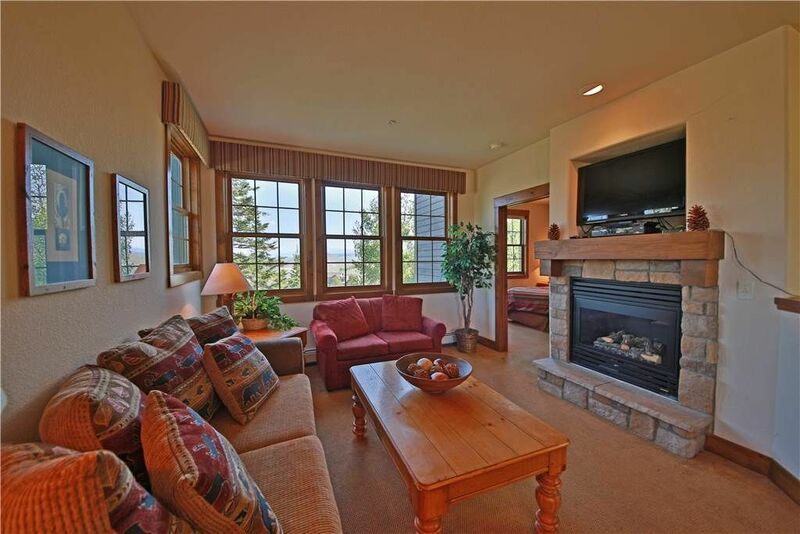 When the chairlift is not running, this condo is still only minutes away from the Granby Ranch main lift. It was cozy and had easy access to the base camp as well as the ski lifts. We will be back as we had a great time at Granby Ranch! We are thrilled you enjoyed your stay in Kicking Horse! It really is a great property for skiing at Granby Ranch. We look forward to you staying with us in the near future. Kind regards, Resort Management Group. Nice condo but needs new/better sheets and new duvets and new towels. All smelled horrible. Also should leave enough TP and garbage bags for length of stay. Carpet needs replaced. Kitchen is well stocked but does not have salt and pepper but 100 plus sugar and creamer packets? We bought extra of everything and left for next guests. The views are amazing. Would stay in kicking horse again and this Location if some updates are made. Carpet needs replaced too.